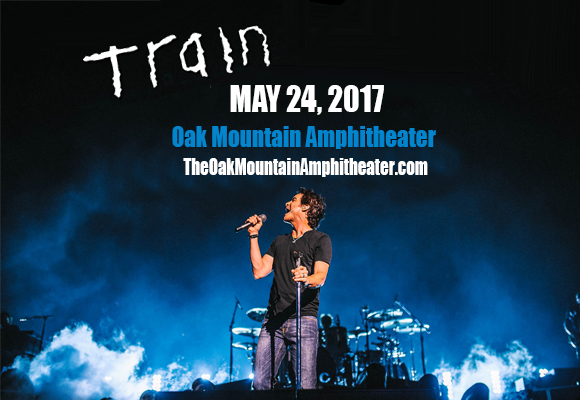 Train fans, get ready as this exciting announcement comes to light! The incredible 90's rockers, Train are once again hitting the road to bring their unforgettable anthems for the LIVE stage and you can grab the chance to be there! Catch them along with sensational opening acts – wispy soul singer, Natasha Bedingfield & fellow rockers, O.A.R! All of them will perform the Oak Mountain Amphitheatre on Wednesday 24th May 2017! If you're a fan, then whatever you do, don't miss it – tickets are bound to sell fast so get yours while you can! The talented Train hit the ball running with their major success back in 1998, with the release of their acclaimed debut album, and now for 20 years they have continued to travel around the globe and play some of the biggest talked about stadium shows to their adoring fans. With Grammy Awards under their belts and unbelievable sales of; 10 million albums, 30 million tracks worldwide (including the RIAA 6x Platinum-certified classic, "Hey, Soul Sister") – it's is no wonder why – book your tickets today for a concert near you as they undoubtably sell out once more, with a line-up that will blow you away… you won't regret it!